Unfortunately, the Autumn Defense show at the Briton's Protection has been cancelled because Wilco have pulled all their UK shows which were due to start next week. Apologies to anyone who was hoping to come down. The AD should be back in the UK in early 2008 for a proper tour of their own though. Also Mike Wolf, editor of Time Out NY talks on WNYC's Soundcheck about what acts will emerge from CMJ unforgotten. According to Wolf, "the embarassingly talented" Patrick Cleandenim is a likely contender. The Autumn Defense - live in Manchester - CANCELLED!!! Broken Horse will be releasing The Autumn Defense's self titled (3rd) album in January 2008 in the UK/Europe. By way of a pre-album launch we are promoting a show for the band in Manchester on Thursday 1st November. 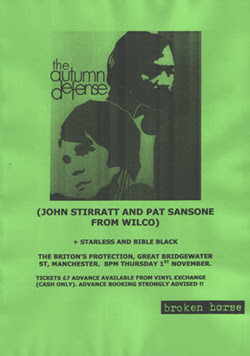 John & Pat will be in town to play with Wilco the next night but will be performing their only European show this year at the very intimate Briton's Protection (which is right next to The Bridgewater Hall). Andrew Morgan is currently residing in Seoul, South Korea teaching English whilst the mixing of his 2nd album is completed. He has started a blog to document his (mis) adventures whilst he's there. You can follow his progress here. "We are nearing completion on The Scurimobile (Dir. Patrick Cleandenim) and it is set to be premiered in New York City in early December. The Scurimobile is an epic, Biblical tragedy set in 17th Century Italy, as performed by The Nile Room Stage Co. in 21st Century New York. It features Ingrid Schram, Philip John Velasco Gabriel, Georgia Gardner Gray, Loren Kramar and more!"